The roots of Euroscepticism among the Czechs go back 10 or 15 years and if Jiří Drahoš defeats the incumbent President Miloš Zeman in a runoff vote on 26-27 January, he will struggle to reverse the trend, political analyst Lubomír Kopeček told EURACTIV. Lubomír Kopeček is a professor of political sciences at the Faculty of Social Studies in Brno, Czech Republic. Last summer he published a book on the political career of the current Czech President Miloš Zeman. Kopeček spoke to EURACTIV Slovakia’s Marián Koreň. In 2013 Miloš Zeman was considered as an accepted politician in the West. At that time he had quite a good reputation. However, we saw a shift in 2014. The number of the business trips heading to the West has dramatically decreased in favour of business trips to the East. Since that time, Zeman has not been very welcome in certain Western countries. It is probably most obvious in the attitude of the United States. He has not deserved any relevant reception from the American administration in 5 years. When Zeman took office in 2013, he hoisted the EU flag at Prague Castle. Nowadays, he supports a referendum on whether to exit from the EU, but says he himself would vote against the exit. What is his real attitude towards the EU? The book I wrote about him is called ‘The Story of a Talented Pragmatist’. It also reflects his attitude towards the EU, which is most obvious when looking into the past: he brought the Czech Republic into the EU, he used to keep very close relations with social democrats from Western Europe and so on. He used to show support to the deepening of European integration and he used to call himself as Eurofederalist. On the other hand, as the orientation towards the East and the issues such as refugees or referendum on withdrawal from the EU were becoming more important to him, the more his interest in the EU was weakening. Nowadays, he is known as one of the most eurosceptic people in the Czech Republic. A huge paradox is hidden inside because even nowadays he sometimes says he is a Eurofederalist. Zeman is a dual person who did not completely give up his previous attitudes but is covering them up with something much more visible. Where can we find the roots of the Czech Euroscepticism? The attitude of the elites is essential, but I am not talking only about the attitude of Miloš Zeman. Since 2006, the emphasis on European issues has been weakening even in case of the political parties which used to be pro-European. I do not mean to say they are no longer pro-European, but they stopped working on the topic. At that moment, Social or Christian Democrats stopped taking it as their priority. The second thing is that the internal topics are getting a European label. It means shifting the blame for unpopular things on the European Union. On the other hand, certain absurd issues, which are coming from the EU and can be easily misused in the political debate, help nourish the Euroscepticism. It is also important to mention the influence of the economic recession which in 2008 – a little bit paradoxically – turned against the positive perception of the EU. In the Czech Republic, the bad mood was reflected in the scepticism towards the EU. You mentioned the attitude of the elites. It is often said that Czech Euroscepticism is very much influenced by the former and current Czech Presidents. Václav Klaus sowed the seeds and Miloš Zeman is continuing it. Could Jiří Drahoš reverse this trend if he becomes the new president of the Czech Republic? Not to reverse but moderate it. In the sense that we will not have a head of state with such eurosceptic positions as we did during the mandate of the two previous presidents. Nevertheless, it is necessary to be careful – the head of the state is influential but he or she is not almighty and cannot completely reverse the moods in society. Jiří Drahoš is nowadays representing the part of the society that is neutral or slightly positive towards the EU. But he would not be able to reverse something which has been forming here for ten or fifteen years along. How important as a topic is the EU in the presidential elections? The Union is usually perceived not as a separate big issue but related to something else. When Zeman is emphasising the issue of the referendum and direct democracy, he is linking it with the withdrawal from the EU. Similarly, refugees and the EU are joint vessels – the EU dictated migration quotas to the Czech Republic. In foreign media, we can read that the Czech president will play a substantial role in the democratic direction of the country after the parliamentary elections. Is this just a journalistic paraphrase or a realistic option? The power pact between Zeman and Prime Minister Andrej Babiš (who resigned after his government lost a confidence vote in mid-January) is not being formed these days, it has been existing in the Czech Republic for a couple of years. The reason for this pact is the fact that they are very helpful to one another. But does it have a long-term perspective? It is questionable. If the government of the ANO movement – with or without Babiš – gets the confidence vote and Miloš Zeman wins another mandate, the objective of the pact will run out, they will not need one another so much anymore. At the same time, the effort to find common ground on more substantial issues, for instance, the attitude towards the European Union, can disappear. The EU is a completely natural space for Andrej Babiš. His behaviour clearly says that he does not want to be in the same position of an unwanted person as Jarosław Kaczyński. He wants to be accepted in Europe. Moreover, the pro-Eastern orientation of the Czech Republic is not a priority for Babiš. In his government programme declaration, there is just one sentence related to China. The declaration says that cooperation with China makes sense only in case it brings advantages to both sides. It is too little. If they are both in positions enabling them to influence Czech politics, it is quite probable this will be a point of conflict. Though, Zeman had already been in conflict with the previous government because of certain topics. In other words, it would be nothing new. What would the victory of Jiří Drahoš mean for the ambitions of Andrej Babiš to be the prime minister? In the short term – nothing, because the current president will still be in office for the next six weeks, even if he does not win. This gives him large space to nominate Andrej Babiš as prime minister for the second time. That is why I do not think Jiří Drahoš will have a chance to influence the nomination of the next prime minister. He might have an indirect influence. 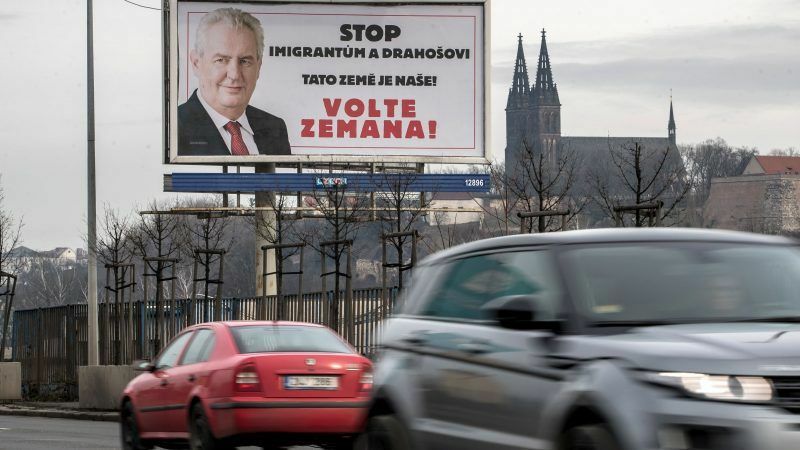 If President Zeman does not win the presidential elections, political players will have to start acting very quickly. There might be a chance for Drahoš to influence the political situation, if the setting up of a new government was dragging on. This could happen only in the summer 2018, but it is extremely unlikely that we would not have a new government by that time. So are you convinced that in case of failure, Miloš Zeman will not miss the opportunity to nominate the Prime Minister for the second time? I doubt he would not take this opportunity. It would be strange if he threw out the possibility to influence the future form of the government and let his opponent decide.